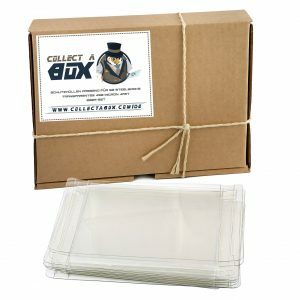 If you are just looking for the “standard” Collector’s Edition Guide you will make a find on Bookdepository.com* and Amazon.com*. After Ubisoft’s E3 2018 conference we know a lot more about Assassin’s Creed Odyssey. We learned that the newest installment takes place in ancient Greece and that we can choose if we want to play as a man or a woman. During the gameplay trailer we also mentioned that the combat system is changed yet again. But that’s not all. Odyssey will have more RPG elements such as multiple choice dialogues, multiple possible quest endings and the ability to romance several characters. Furthermore, Odyssey will bring back naval combat which was a huge part of Black Flag and Rogue and you can almost recruit every character in the game to join your crew. 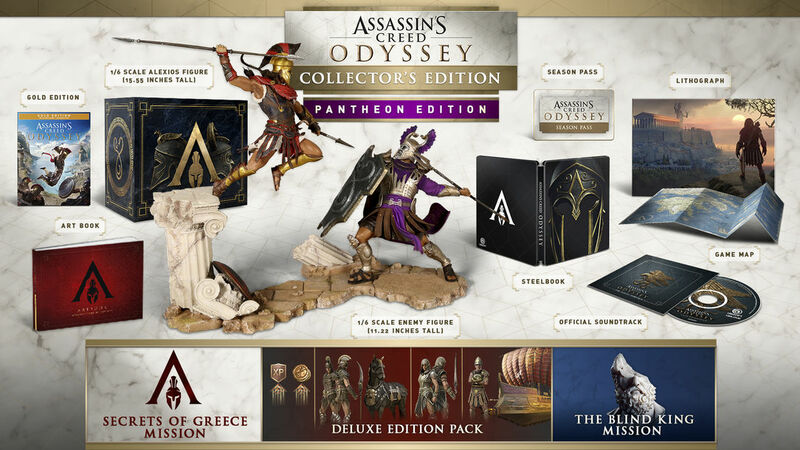 The game world will be one of the biggest for the AC series and just like with previous Assassin’s Creed games there are a hell of a lot of Collector’s Editions available for Odyssey. 32 page Artbook: Featuring the artworks from Ubisoft Quebec artists that led to the creation of the game. The Omega Edition can be pre-ordered at Game UK* for £54.99 GBP. 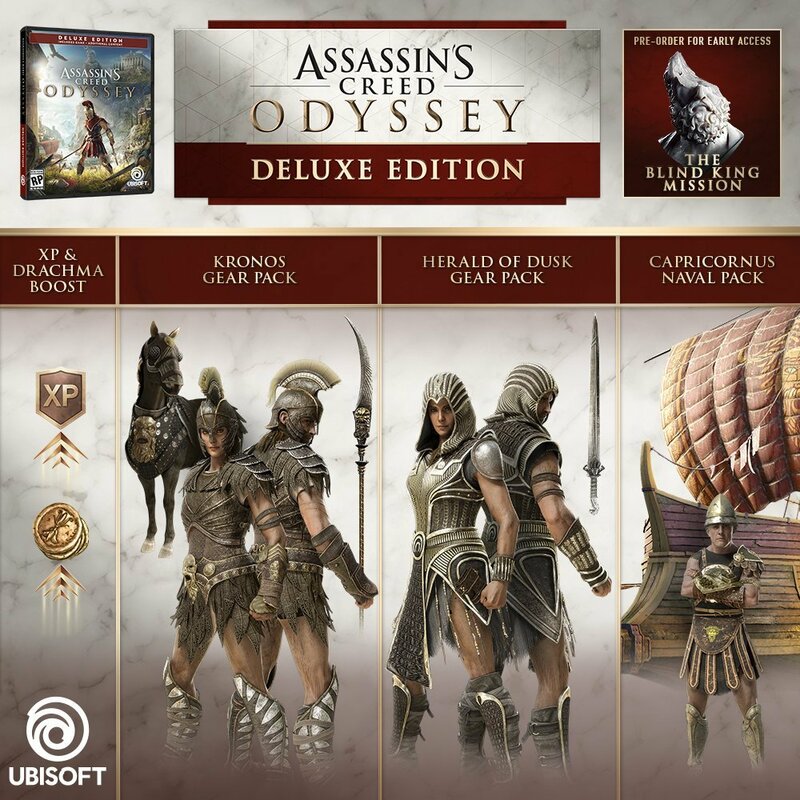 The Deluxe Edition is priced at $79.99 USD and can be pre-ordered at Amazon.com* The Edition is also eligible for an upgrade to the Ultimate Edition* which includes all the Gold Edition and Deluxe Edition content, including early access three days before the game’s public release and the season pass. 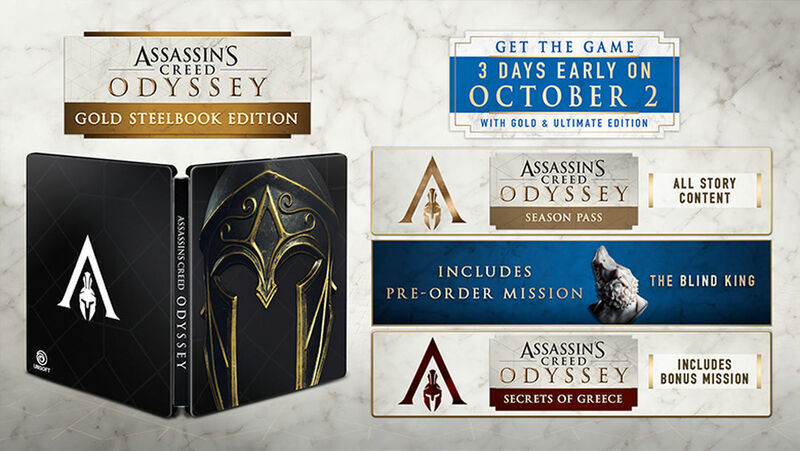 The Gold Edition (UK* / US*) will be available worldwide either as a digital download or as physical version for $99.99 USD / £79.99 GBP and allows you to play the game three days early and continue your odyssey with the Season Pass. If you are a sucker for Steelbooks you can upgrade to the Gold Steelbook Edition* for 10 bucks. 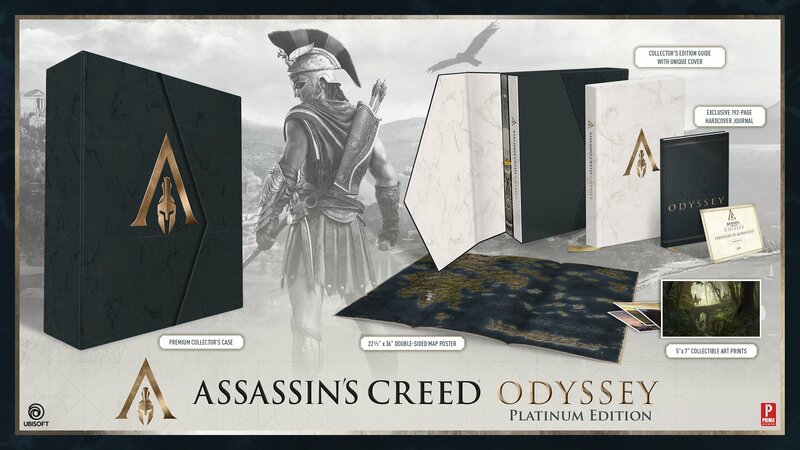 The Gold Steelbook Edition is exclusive to North America. 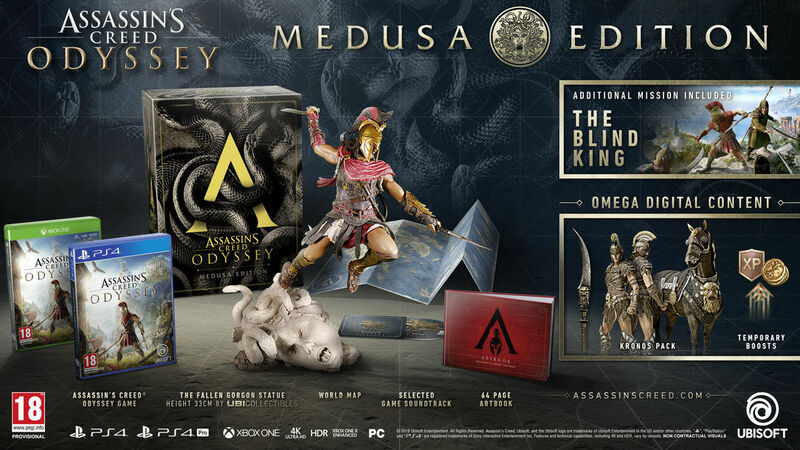 The Medusa Edition can be pre-ordered at Game UK* (£104.99 GBP) and Amazon.co.uk* (£99.99 GBP). 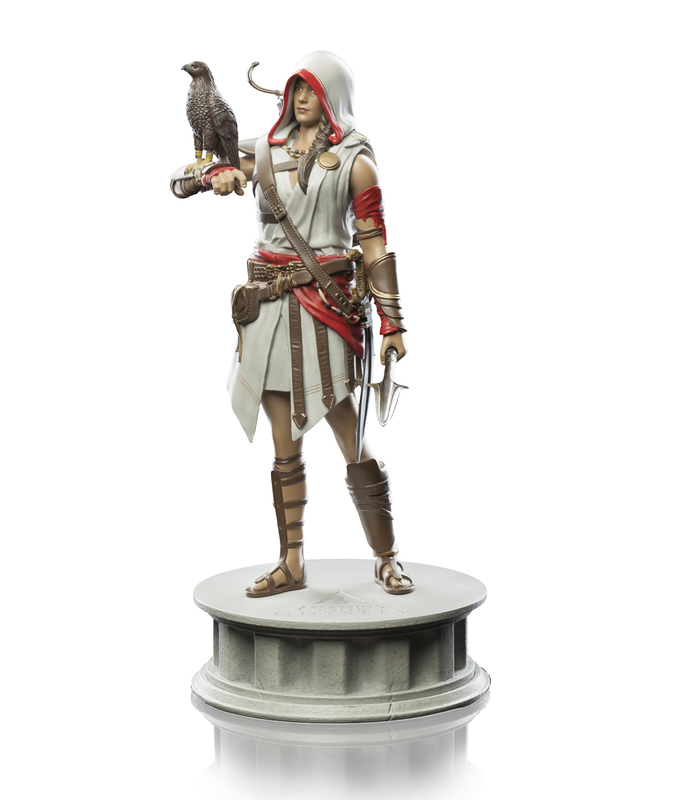 The Kassandra Edition of Assassin’s Creed Odyssey is exclusive to North America and includes in addition to the Steelbook Gold Edition a 9 inch tall Kassandra figurine. The Edition is exclusively sold through Gamestop.com* for $149.99 USD. 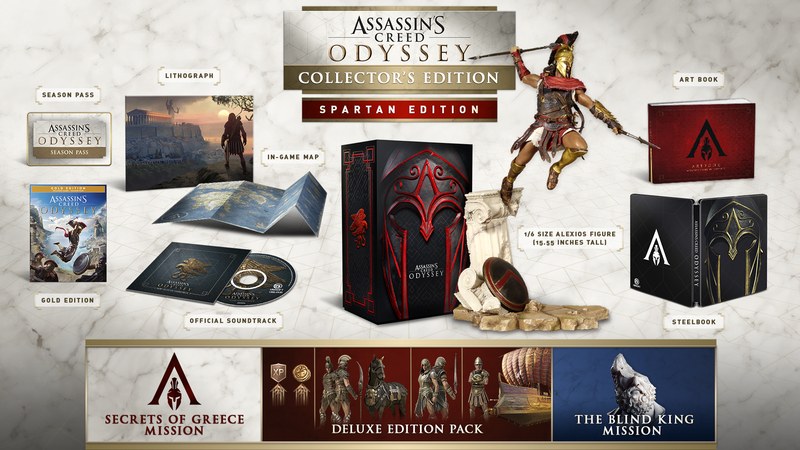 The Spartan Edition is priced at $159.99 USD / £144.99 GBP and can be pre-ordered from the official Ubisoft Store (US / UK).